What is the Tracer tool for? How do I get started using it to see details about my activities and flows? 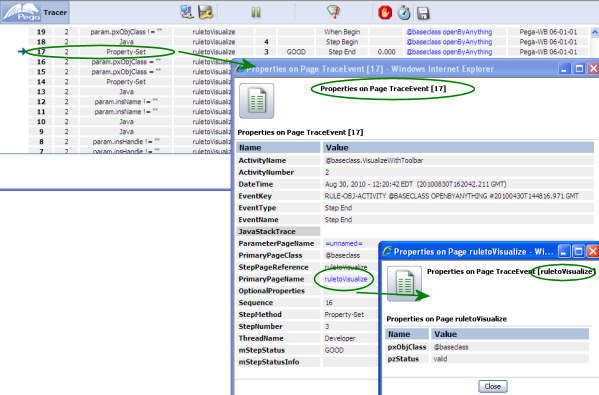 Use the Tracer tool to test and debug activities, flows, and other rules. Within the Tracer tool, you can see the processing performed during run-time in summary or in detail. You can pause and resume processing, view or set the value of watch variables, and drill down to step-by-step details. You can view trace events for any requestor connected to your server node, not just your own session (if you know the connection ID of the session)..
To start the Tracer tool, click the Tracer icon ( ) on the Quick Access bar of the Designer Studio to trace your current session and Thread. When you first open the tool, the rows of the Tracer results display are empty. When you take a subsequent action in the system, the Tracer tool adds rows according to the trace criteria specified in the Trace Options. By using various Trace options, you can set very fine-grained control over what you wish recorded in the execution trace. You specify the applicable events, break conditions, and targeted RuleSets. You can interact with the Tracer tool's results display to drill down for more information on specific events. By clicking on the values in the display columns, you can learn more about the event associated with that row, including seeing a Java stack trace if an exception occurred. For example, in the illustration below, clicking the row identifier 17 in the Tracer results display opens a window that shows many facts about that event, and clicking the name of the primary page (ruletoVisualize) opens a window that shows information about that page. Sometimes, you may not see rows that you expect to see in the Trader results display; for example, steps for certain activities. 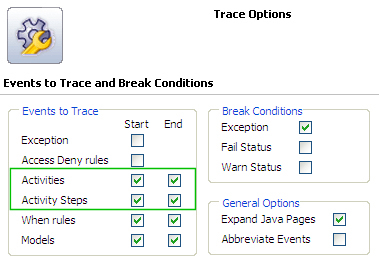 A likely cause of not seeing any steps in the Tracer results is related to the Trace options being applied -- options set in either the Events to Trace or the RuleSets to Trace sections of the Trace Options window. For example, the Tracer enforces RuleSet access controls. In the Events to Trace section, verify that the Start and End check boxes are selected for Activities and Activity Steps. In the Trace Options window, scroll down to the RuleSets to Trace section and verify that the RuleSets for those activities are selected. 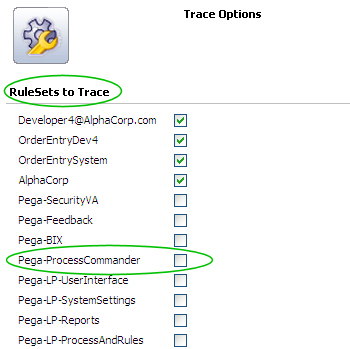 For example, in the following picture, activities in the Pega-ProcessCommander RuleSet are not traced because that RuleSet is unchecked.